On this day in 1995, crime novelist Ross Thomas passed away in Santa Monica, Calif. In his honor, we're highlighting a few of the best books from this prolific Southern California author, who also wrote under the pen name Oliver Bleeck. Born in Oklahoma City in 1926, Thomas served as a U.S. infantryman in the Philippines during World War II before becoming a reporter, a public relations staffer and eventually a political campaign strategist. He released his first novel, The Cold War Swap, in 1966. Over the course of his career, he produced nearly two dozen witty thrillers, many of which exposed the dark underbelly of politics. When Lucifer Dye is released from three months in a Hong Kong prison, debriefed and handed a false passport, a new wardrobe and a $20,000 check, his haughty control makes it clear that Dye's career with his country has been permanently terminated. But a good agent is always in demand, and just a few hours later, Dye is being interviewed for a highly ingenious position. Victor Orcutt, although a not very good imitation of a British pre-war gent, has creative talents of his own. He has his sights on a small southern city, with the ordinary run-of-the-mill corruption one would expect in such a place. The canny Orcott knows there's no profit in that. His creed is "To get better, it must be much worse." He and his two associates have looked up Dye's history, and he now offers the ex-spy a mission. For two and a half times the government's bounty, Dye is to thoroughly corrupt the town. And the sly Dye takes the offer. "If you read crime novels and haven't yet discovered Ross Thomas, treat yourself to The Fools in Town Are On Our Side," says Amazon reviewer Mal W., who rated it five stars. "It's one of the most delicious send-ups of small-town politics I've ever come across." Buy The Fools in Town Are On Our Side on Amazon. A long-distance call from a Texas city on his birthday gives Benjamin Dill the news that his sister Felicity - it's her birthday, too, and they were born exactly 10 years apart - has died in a car bomb explosion. It's the chief of police calling. Felicity Dill worked for him as a homicide detective. Dill is there that night, the beginning of his dogged search for her killer. What he finds is no surprise to him, because Benjamin Dill is never surprised at what awful things people will do - but it's a real surprise to the reader. 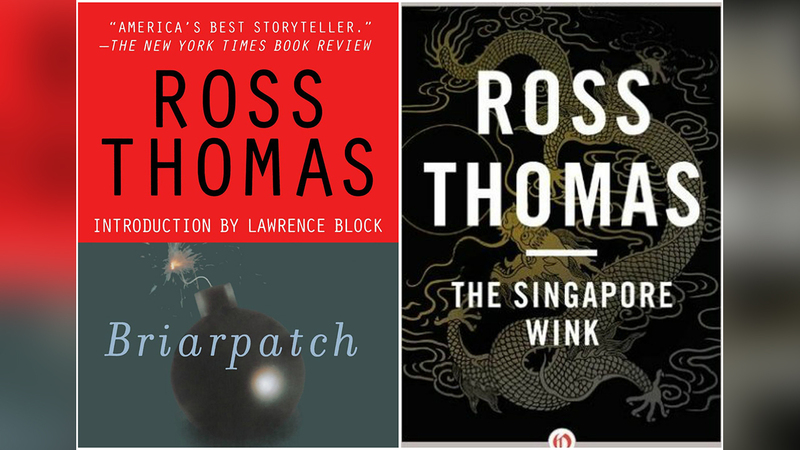 "I've never read a Ross Thomas book I didn't thoroughly enjoy. This particular one was a real treat," wrote reviewer Bill H., who awarded the book five stars. "I thought the character development and the plot line in this story were especially intriguing. Thomas is always very skillful at describing clothing and distinctive features that make his people come alive." In this early Thomas novel, a stuntman searches for a long-lost colleague, whom he previously thought he had killed on a movie set. It holds 4.5 stars across 13 customer reviews on Amazon. Two pirates do battle on an old junk ship in Singapore Harbor. They leap nimbly from deck to rigging, crossing swords like fencing masters. And then one surprises the other, slicing a rope and sending the unfortunate pirate tumbling into the bay. This is how stuntman Angelo Sacchetti dies. Edward Cauthorne was his opponent, a fellow stuntman whose career died along with Sacchetti. He's selling used cars when two thugs approach him. They're emissaries from Sacchetti's godfather, a Mafia don. Sacchetti is alive, after all - alive enough to be blackmailing the don - and they firmly request that Cauthorne find him. The search takes Cauthorne back to Singapore to risk his own life for the sake of the man he thought he'd killed. "The late Ross Thomas wrote wonderful books, some more wonderful than others, but all worth reading," says five-star Amazon reviewer Dan G. "This one is no exception." Buy The Singapore Wink on Amazon.